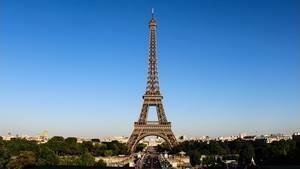 This page aims to give an answer to the two questions "Why is the Eiffel Tower made of iron?" 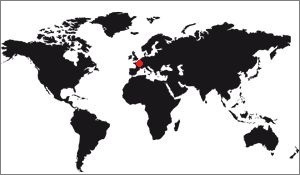 and "Where does the Eiffel Tower come from?" Reflecting on it you can ask the first question because this choice is not without problems. It is known, for example, that iron is a softer metal than average, and that it oxidizes easily. Why choose it for a large outdoor building, so difficult to maintain, while other metals such as steel would have been more convenient? In fact there are several answers to this question. But to get there, you have to go back in time. Choice of metal: Why iron? First of all, we must take into account the scope of this choice. The goal is to build a tower 300m (1000 feet) high. All buildings until the mid-nineteenth century are stone or, more frequently, masonry. The advantages are multiple: solidity, ease of implementation, modularity, but masonry faces a major problem: its weight. The higher the construction, the more it is heavy. As a result, the upper parts support the lower parts to such an extent that the material used eventually fractures. The result is a collapse of the building that happens depending on the amount of material used and the weight that the lower parts have to support. For the strongest stone, a pressure of 30 Kg per square centimeter is considered the limit not to be exceeded. In addition, it is necessary that the equipment of stones is of a high quality so that the building can hold at such pressure. In his book "The Tower of 300 meters", Gustave Eiffel takes example on the Washington monument to support his choice of iron for the tower. It indicates that it measures 169.25 m for a square base of only 16.75 m which is narrowing to 10.50 m. It is empty, with a thickness of the walls at the base of 4.50 m going narrowing themselves until only 50 cm at the top. It is made of granite with marble cladding, which gives it a weight of 45,000 tons above the foundations. This weight, spread over a base of 223 square meters, gives a coefficient of compression of 20 kg per square centimeter. Taking into account the force of the wind, this coefficient rises to 26.5 Kg, which is dangerously close to the limit that the stone can bear. And again, the Washington Monument was originally designed on plans going up the building to 183 meters in height, surrounded by a Pantheon with a colonnade forming a peristyle, but arrived at 46 m height workers found that he was leaning dangerously and we had to see it down again, as long as we consolidated the foundations. The difficulties encountered in the construction of this obelisk, begun in 1840 and inaugurated in 1884, tend to prove that masonry is not intended to be used for tall buildings. So we had to find another material. The cast iron was interesting but if this metal is resistant to compression, this is not the case for other constraints, such as stretching Steel could have been chosen but this metal is too rigid for a structure that requires as much flexibility as resistance. Moreover at that time steel was very expensive to manufacture, it was only during the twentieth century that this metal was democratized, with the use of new production methods. It remained the iron, whose properties of resistance and flexibility were well suited to this project. However, at the end of the 19th century, metal processing methods were in full expansion. Having the habit of using cast iron in his first projects of metal bridges, Gustave Eiffel has studied the "puddled iron", which is a material from melting. It is he who will be used for the construction of the Eiffel Tower. Here is what Gustave Eiffel said, once the tower is completed. It is primarily his resistance. From the point of view of the charges that can be safely supported to one or the other of these materials, it is known that, with an equal surface, iron is ten times stronger than wood and twenty times stronger than the stone. It is in large constructions especially that the resistance of the metal makes it superior to other materials. The relative lightness of metal constructions at the same time makes it possible to reduce the importance of supports and foundations. To cite just one example, that of the Tower of the Exhibition, I surprised more than one person who was worried about the load on the foundations floor, saying that he would not be more charged than that of a house in Paris. Puddling is treating the cast iron to lose some of its carbon, making it less prone to corrosion. It is a refining process that uses waste from the metallurgical industry called "slag" (more or less large metal blocks rejected by the previous techniques and which are used here to absorb carbon). We speak of "decarburization". 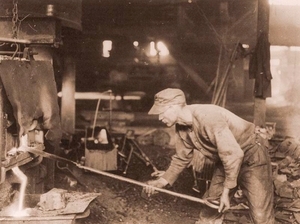 Worker in the process of puddling iron at the factory. The technique consists of heating the cast iron to a very high temperature and mixing it with the slag in the most homogeneous way possible, even if the result obtained will be partly called into question during the forging, which will stretch the iron obtained and thus modify the carbon concentration in each room. The mixture is made by a builder, in charge of this stain. He has at his disposal a very elongated hook, the "cheesy", to make the mixture. When he thinks he has treated the cast iron enough, it comes out of molten iron, called "puddled iron". This iron is then forged and handed over to industrialists for their work. In the case of the Eiffel Tower one of the interests was that the low carbon content made the iron less prone to corrosion. The word 'Puddlage' is a French verb 'to puddle', 'to brew'. The puddling process was perfected by Henry Cort in 1784, then significantly improved by Samuel Baldwin Rogers and Joseph Hall in the nineteenth century. It will disappear over time in the face of the arrival of steel processing processes, more efficient and cheaper. Here is a little text explaining, with words of the time, the interest of pudllé iron. Pudlled steel is produced in reverberatory furnaces by heating, by means of coal, the steels that are deposited on a bed of slag, until they melt and melt. begin to refine. It is frequently stirred, adding still slag, or iron peroxide, or manganese peroxide, or sub-carbonate of soda or salt, etc., and we leave the pasty matter by pieces of 40 to 50 Kg which is then stretched successively under the hammer. It takes about two hours for each operation. We make 5 to 6 loads of 200 Kg per day. A puddler oven can produce 30 to 40 tons of steel a month, some of which produce up to 50 tons. Puddled steels thus obtained can be used, unreinforced, in the manufacture of many objects, by reutilising them in the same oven in which they are puddled and then stretching them to the desired dimensions under the martinet or under the rolling mill. But if we want to make them even more homogeneous, we must submit them to the wrought, like the natural raw steels obtained by the old process. 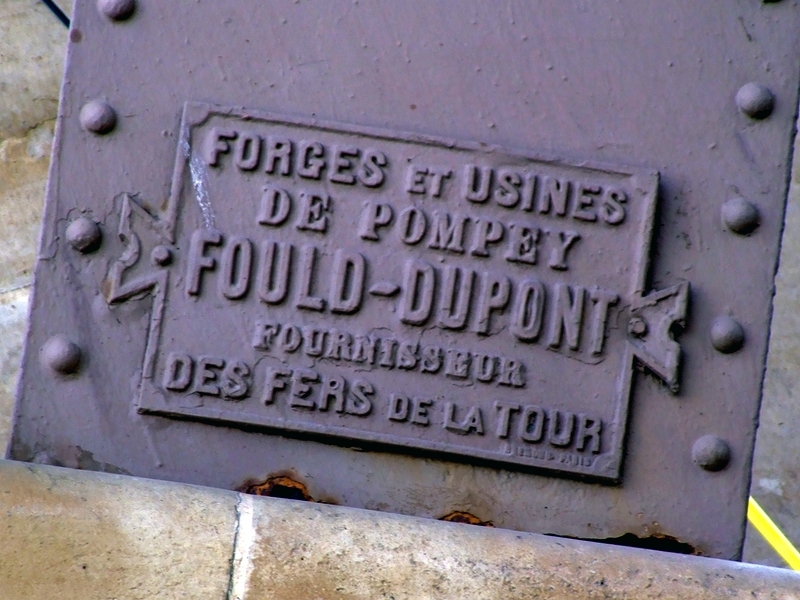 Gustave Eiffel, when he definitively decided to build his tower, got closer to Mr Prégre, the Parisian representative of a usual supplier of his workshops, the Forges and Factories of Pompey "Fould-Dupont", which find in Lorraine. Pompey is a town of 5000 inhabitants located in Meurthe-et-Moselle, near Nancy. In 1871, Auguste Dupont, founder of the steelworks of Ars-sur-Moselle, was forced to move his factory to prevent it from crossing the Prussian territory, following the loss of Alsace-Lorraine in 1870. He chose Pompey, this is the reason for the presence of this plant in this small wine village. When Gustave Eiffel ordered 8,500 tons of puddled iron, and 2.5 million rivets, the latter turned to its suppliers of ore. The quality demanded by Eiffel is to be recovered in local mines in Lorraine. Let us remember that all the East and the North of France were covered with mines of iron, coal and various ores. The iron of the Eiffel Tower comes from France. There is a legend, a rumor at least, circulating. And your favorite site fell into the panel by trusting this information, wrongly, before rectifying here. 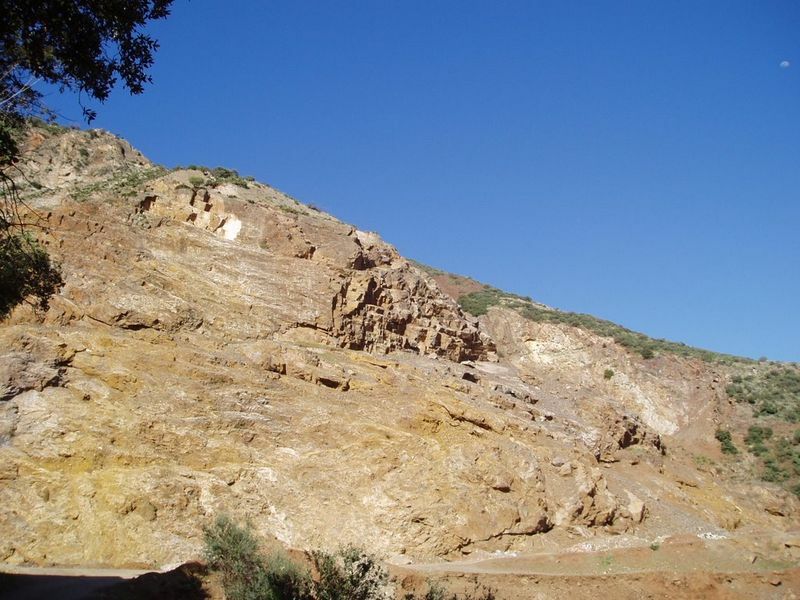 It seems that the iron of the Eiffel Tower comes from the mines of Zaccar and Rouïna, two distinct sites, in Algeria. Well, it's wrong. 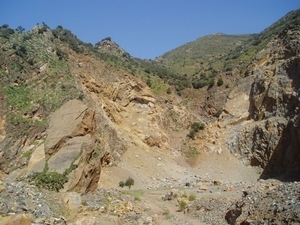 The mines of Zaccar are in Algeria, in Miliana. It is a city in the North of Algeria, close to the sea and in full Atlas. The mine is surprising, its entrance is a mere hole two meters in diameter, on the hillsides of the mountain. It descends by a steep ladder, and at the bottom part a gallery lit by low-light lamps. The shoring is poor, the gallery eventually arrive at a well over 10 meters deep. It is at the bottom of this well that the extraction galleries begin. 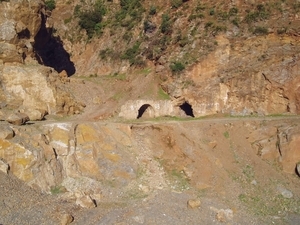 These galleries are equipped with railways and wagons in which are poured the rocks. Drawn by men, they are then emptied into a pit that falls on open terraces. It is from these terraces that one recovered the stones before loading and sending in Lorraine. It should be noted that this site is not an industrial site, which is why there is no equipment like blast furnaces. It's just an extraction site. It also explains why the mine is not indicated, there is no interest nowadays to go, but it should be known that it has employed up to 1,800 people, a quarter of the population of the city. However, no ore came out to build the Eiffel Tower, no. When Rouïna is a city in Algeria, close enough to Miliana. It has nowadays more than 20 000 inhabitants. The mountains nearby are loaded with a particularly pure iron. During the French occupation the Rouïna mine was equipped with state-of-the-art steel infrastructure, including a medium-temperature blast furnace. 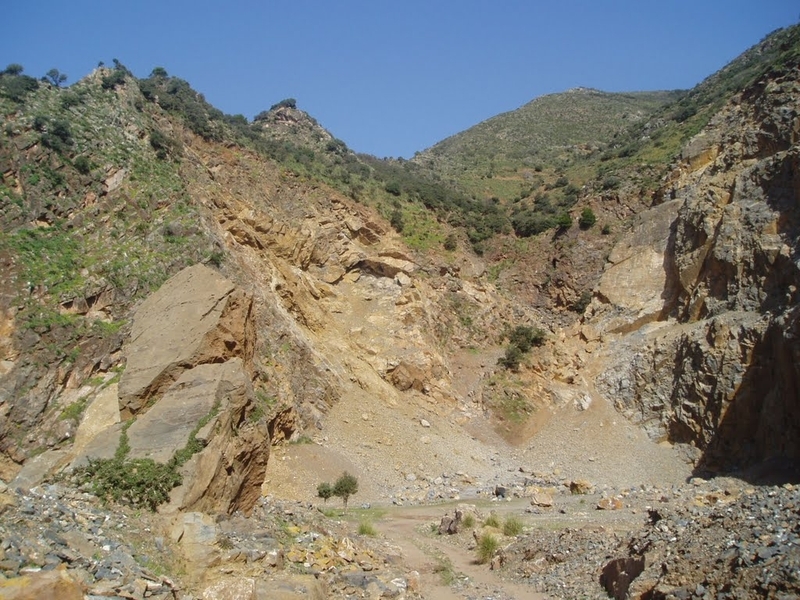 The ore extracted from it was crushed and sent to these smelters in Algeria or France. 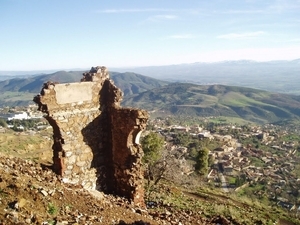 Nowadays the site is abandoned.